A live-action Saturday morning children's show on CBS, created by Filmation in 1978, Jason of Star Command harkened back to the 1930s Flash Gordon movie serials, appearing in its first season in 15-minute installments coupled with a cartoon short, and in its second season as self-contained half-hour stories. Each episode featured Jason battling the evil Emperor Dragos, as the latter tried to destroy Star Command, a base hidden in an asteroid that publicly housed the Space Academy from the previous series. While the show was never very good, it did have some impressive budget model work and even some Stop Motion Animation. Badass Pacifist: Jason. In fact, no one carried weapons. This was a Saturday morning children's series after all. Cloning Blues: The first episode featured Dragos infiltrating Star Command with a clone of the base commander (played by James Doohan!). Cosmopolitan Council: In season 2, Dragos seems to have this aboard his new Dragonship. They seem to be a reuse of the hairy creatures that were his servants in Season 1. They even speak the same gibberish that only Dragos seems to comprehend. Their only purpose seems to be exposition. We need someone for Dragos to explain his latest schemes to as well as remind us of how much of a meddler Jason is. Cliffhanger: Every episode of the first season. Expy: Jason was a far more clean cut Han Solo. Mildly Military: Definitely under James Doohan's Commander. Even "by the book" Commander Stone started to loosen up almost immediately. "Open!" Says Me: Jason does this in the opening credits, and in a fair number of episodes. Punny Name: Professor Parsafoot. Well, not really. But we get the impression that the new Commander wasn't just mis-remembering the Professor's name when they meet in person. "So... Professor Pussyfoot, was it? Robot Buddy: W1K1, a pocket-sized robot that Jason kept in a belt pouch. The robot packed a small laser torch, and could fly from ground to orbit! Superman Stays Out of Gotham: If Star Command is supposed to be somewhere in the Space Acacemy, one would think that Jonathan Harris' commander from that series would get involved in all the major events that threaten the base (especially since the Academy is implied to be the majority of the station with Star Command a secret subset of it). But, with the exception of Peepo the robot, we don't hear a peep (no pun intended) from him or any of the other characters from that series. 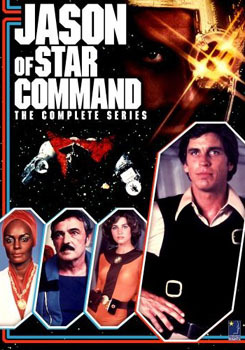 note The real reason for this is that Harris was originally intended to reprise his "Commander Gampu" role for Star Command, but left the show after a dispute with producer Lou Scheimer. Unreliable Narrator: The opening narration tells us that Star Command is in a secret part of Space Academy. Nevertheless, Dragos and everyone else seems to know exactly where it is. And is a cadet school the safest place to hide a crucial military installation?